The Web will continue to expand rapidly into all businesses and into more and more households. It will be as common as the telephone or television in a few years. The fact that less than 1% of retail transactions today are on the web is unimportant. For commerce, the web is primarily a business-to-business vehicle, and will probably remain so. Many consumer retail web sites being launched today will probably fail or be absorbed. The Web is the greatest direct marketing vehicle ever invented. It makes one-to-one marketing a serious possibility. Any marketer who ignores the Web today is making a big mistake. The real money to be made right now in the Web is in customer relationship management. Let me explain the way it works. In the 1980s all mid-sized and larger businesses acquired toll free numbers so that customers could contact them. At first, they had no idea what to do when the customers actually called. Anyone who doubted this had only to dial up the toll free numbers on the products that they bought in the early days. They got a bewildered customer service rep who didn’t know what to say. Eventually firms found out what customers wanted to know. They equipped their customer service reps with computers that had access to the relevant information. FedEx pioneered with their package tracking system so that any customer could call the toll free number to find out where their package was. 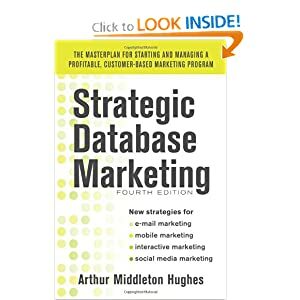 Soon, database marketers realized that these customer calls were ideal vehicles for building customer relationships. They added individual customer purchasing history to the reps’ screens so that they could know who they were talking to, what they had purchased. Banks went one step further. They computed customer profitability on a monthly basis and segmented customers into five categories, from gold down to lead. They discovered that more than half of their customers were unprofitable. But they also began to realize that their gold customers were terribly important to the bank’s future. They added Caller ID, linked to their customer database, so when their customers called, they could route gold customers automatically to a dream team. They soon understood that customer retention was partially a function of the number of products owned. So they added “Next Best Product” to the customer reps screens so they could have something profitable to talk to the customers about when they called. Catalogers did the same. Talking to customers became big business. But toll free numbers are expensive. The main costs are not the phone calls, but the salaries of the agents who manipulate computers to find the answers to customers’ questions, reading the answers off their screens. Then along came the Internet. FedEx was one of the first to realize it’s true potential. They put their entire tracking system on the Web, so customers could dial up and find the status of all of their packages at any hour of the day or night, without talking to an operator, or getting put on eternity hold. Anyone who has used the FedEx tracking system knows how useful it is. What the customers may not realize is that it saves FedEx millions of dollars a year. The Web accomplishes three feats simultaneously: it makes customers happy, it builds loyalty and it saves money. What is the principle here? I call it “Letting them come behind the counter.” Just about every company in the world has a sign on the wall someplace that says, “Authorized personnel only.” You don’t let customers go back into the accounting department, or wander around in your warehouse. But the web has changed all that. Companies have learned that they can give customers access to the kind of information that their customer service reps are reading off their computer screens. They have written the software so that customers can manipulate their keyboards and mice to act like company employees: reading technical information, wandering through warehouses, looking up their own shipping and billing information, and placing their own orders. They can eliminate hundreds of rep jobs. Some business-to-business companies have gone one step further: vendor-managed inventory on the Web. With this system, a manufacturer keeps track in his computer of the inventory in his customer’s warehouses. As each item is taken off the customer’s shelves for use or resale, daily automatic electronic notices are exchanged between customer and manufacturer. New products are automatically shipped to keep the shelves at optimum levels. Optimum quantities are automatically revised based on usage. Product obsolescence is eliminated by automated, quarterly return material authorizations with no restocking charge. Purchasing and receiving paperwork is almost eliminated. Customers have lower inventory costs. They never run out of needed items. So what are we accomplishing by “Letting Them Come Behind the Counter”? We are making customers happy, building customer loyalty, increasing sales, saving millions of dollars, and making the world a better place to live. What more could you want?